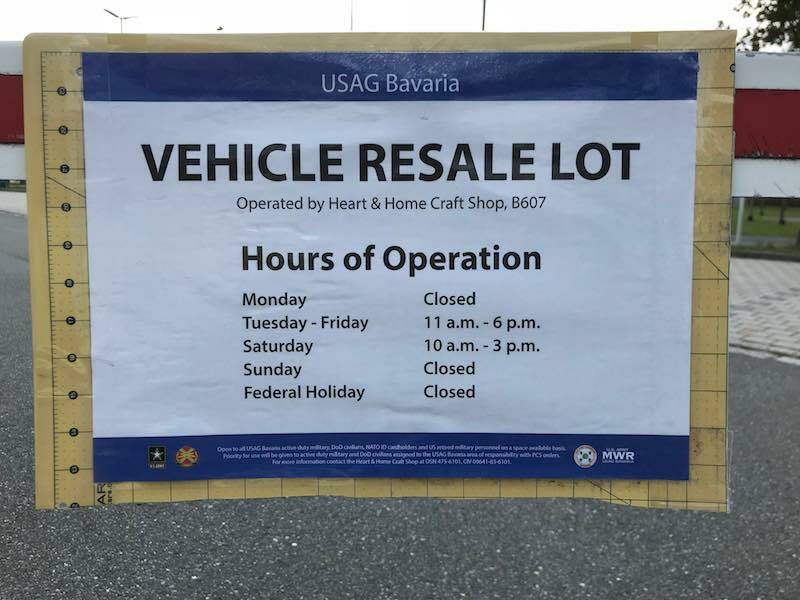 GRAFENWOEHR, Germany — Members of the U.S. Army Garrison Bavaria community wanting to sell or buy a used vehicle can now do so at the Vehicle Resale Lot at Tower Barracks. The lot replaces a temporary impound lot near Gate 6 and is part of a wide effort to clear abandoned vehicles from Tower Barracks. The Vehicle Resale Lot is an area on most military installations with enough logistical support for DOD ID card holders to register their privately-owned vehicle for sale, said Daniel Vanwinkle, a Recreation Assistant for USAG Bavaria. Any for-sale vehicle must have a current registration and/or vehicle inspection. Car owners had previously abandoned their vehicles around Rose and Tower Barracks or at a temporary “Lemon Lot” located near Gate 6 at Tower Barracks. Abandoned vehicles take up limited parking, pose environmental concerns such as fluid leaks, and clutter open spaces which is a huge problem for our community, said USAG Bavaria Command Sgt. Maj. Micheal D. Sutterfield. Abandoning a vehicle can potentially break Host Nation laws and disposal of these vehicles is costly to USAG Bavaria. “The garrison ends up having to pay for the man hours and equipment for disposal of the vehicles,” Sutterfield said. The new Vehicle Resale Lot is located at the Heart & Home Craft Shop, Bldg. 607, parking lot and shares the same hours as the craft shop. Tuesday – Friday: 11 a.m. to 6 p.m. Utilization of the Vehicle Resale Lot is open to all USAG Bavaria active duty military, DoD civilians, NATO ID cardholders and US retired military personnel on a space available basis. Priority for use will be given to active duty military and DoD civilians assigned to the USAG Bavaria area of responsibility with permanent change of station orders. 1. Vehicles must be registered and insured during the duration of the permit. 2. The Vehicle Resale Lot permit must be prominently displayed on the dashboard of the vehicle or the vehicle may be towed. 3. Permit fee is $30 per month. 4. Use of the lot is for private vehicle sales only (no commercial sales operations are allowed). 5. The Vehicle Resale Lot may not be used for long term storage of vehicles. 6. Vehicles with no permit or expired permit will be towed to the military police lot at the owner’s expense. Abandoned vehicles will become property of the Family and Morale, Welfare and Recreation Auto Donation Program and be subject to disposal in accordance with DOD regulation 4160.21, paragraph 56. 7. Use of the lot is a privilege, not an entitlement. Violations of this application will result in termination of the permit, removal of the vehicle and appropriate notification to the chain of command. 8. The vehicle assigned to the permit may only be parked in the assigned space for the duration of the permit. Any other vehicle occupying the space during the duration of the permit will be subject to removal. 9. The Directorate of Family and MWR is not responsible for any loss or damage to vehicles as a result of being parked in the Vehicle Resale Lot. 10. You must notify the Heart and Home Craft Shop when the vehicle is sold and when the space will be available for the next applicant. 11. If you need more time to sell your vehicle, go to Heart and Home Craft Shop, located at Tower Barracks Bldg. 607 to apply for a new permit. “If somebody wants to buy a vehicle we are not actually a selling agent. We only run the area for people to place their vehicle for sale,” Vanwinkle said. For those interested in purchasing a vehicle located on the lot, all of the appropriate contact information will be posted within each vehicle for sale.